Beeswax is a natural secretion of honeybees.Â Our (food-grade) 100% pure beeswax has had little processing and is simply washed, melted (to 100c) filtered to remove impurities and formed into easy-to-use pellets.Â This produces a rich, yellow wax that is very stable and free of impurities and toxins. 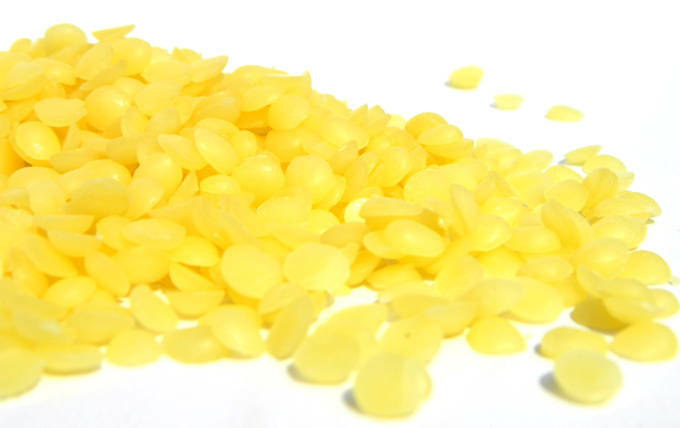 With a melting point of around 62-69c, it can be added to creams, lotions, butter, balms, hair products and soap formulations to give â€˜bodyâ€™, firmness and some resistance to melting (depending on quantity used).Â Beeswax is often used as a natural emulsifier and used extensively in candle making. Beeswax is an excellent emollient and has superb skin-softening properties.Â It is a perfect addition to formulations designed to combat extremely dry and chapped skin.Â It can be comedogenic (has a tendency to block pores) so it is best used with caution in facial formulations. Our beeswax has not been tested on animals for cosmetic purposes by or on behalf of Fresholi.Â Complies with Humane Cosmetics Standard criteria.Â No animals have been harmed nor cruelty inflicted in its production. It is free of residuals, impurities and toxins.Â Allergen-free (cosmetic). Available in 50g, 100g, 250g, 500g, 1kg, 5kg packets.